Book Review - Dorothy L. Sayers's Whose Body? While Poirot takes on cases that are immense in scope, occasionally he takes on those smaller, but still significant cases, sometimes with the fate of the world in the balance, that can be solved very quickly, comme ca. From jewel heists to mysterious deaths, people in disguises to Egyptian curses, disappearances, both staged and unfortunate, to a will most cunningly hidden, Poirot has a host of clients, thankfully none of them with missing dogs. Poirot's genius succeeds at every turn and the police and Hastings are baffled that his little grey cells are able to make such leaps of intuition, in more than one case, without even leaving his bed. Because all you need is your little grey cells, everything else is just fodder. Recently I read an article about Terry Pratchett and his distaste for modern storytelling, in particular Doctor Who. In the interview he said "On planet Earth it's generally taken for granted that it's a bad thing to introduce into a narrative some last-minute solution that was totally unexpected and unheralded ... The unexpected, unadvertised solution which kisses it all better is known as a deus ex machina – literally, a god from the machine. And a god from the machine is what the Doctor now is. A decent detective story provides you with enough tantalising information to allow you to make a stab at a solution before the famous detective struts his stuff in the library. Doctor Who replaces this with speed, fast talking, and what appears to be that wonderful element 'makeitupasyougalongeum'." This is exactly my problem when you take a Poirot story and make it short. I have always had reservations about short stories. They can be shallow and way too short. With the case of Poirot, you don't get the joy of following him every step of the way so that it's conceivable that you could solve it, instead you get his, and here's how it happened, with Poirot as God. We aren't given "enough tantalising information!" Also, while I was familiar with a lot of these stories from the TV series, I can see why they had to expand and pad them out, they were making them what Christie should have made them in the first place, fully formed stories without "unexpected and unheralded" endings. Instead, we are left with Hastings scratching out heads. And if I've said it once I'll say it a thousand times, I do not want any comparison between me and Hastings, thank you very much. 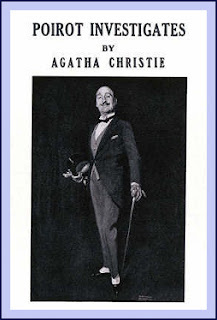 Speaking of Hastings... he seems really a little hard on Poirot in his narration. Always commenting on how Poirot is full of himself, a little man with a big ego and unjustifiably vain in his abilities. I'm sorry Hastings, but seeing as he can solve cases without leaving his house and is able to get a result every time, that isn't unjustifiably vain, it's justifiably vain. That lovely little Belgian has every right to toot his own horn, and you even are going "How does he do it?" and marvelling at his little grey cells. You can't praise him to his face and then grumble about his genius too! You can't have it both ways the way you are written. Either you think he's vain or he's a justifiably vain genius, you aren't written to begrudgingly talk about his genius. You are astounded so much that your carping on makes you sound like a bitter little man not accepting of his friends personality quirks but still riding his coattails. Another reason not to like Hastings. The Argentine can't come soon enough for you matey.